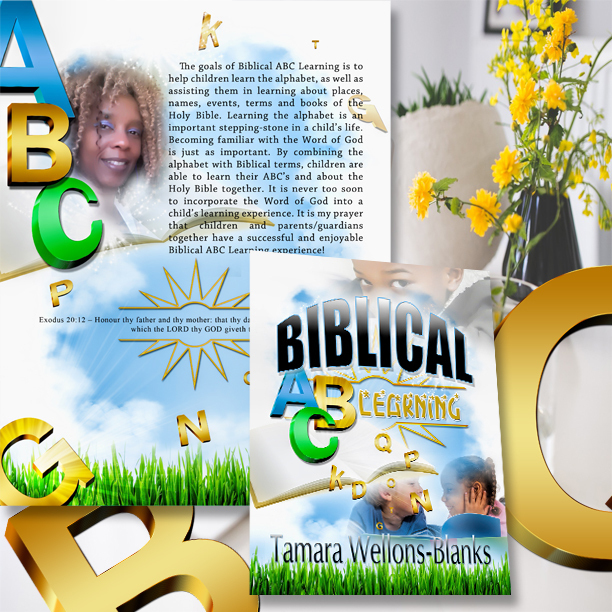 My excitement is continuous for the release of my first publication entitled "Biblical ABC Learning!" The goals of Biblical ABC Learning are for children to learn the alphabet, as well as various people, places, events and books of the Bible. Children will be able to enjoy fun and exciting illustrations for each letter of the alphabet! Children will also be able to use the Bible to learn more about the person, place, event or book of the Bible because reference scriptures are included! Biblical ABC Learning can also be an introductory or enhancement to a child's knowledge of the Word of God. It is never too soon to incorporate the Holy Bible into a child's learning experience! Giving credit where credit is due to the creative professionals helping to bring life to "Biblical ABC Learning!" The beautiful cover design creation is by Kenny, of Black Encryption Designs! His creativity goes beyond the cover! Visit his website at www.theblackdistrict.com to see more of skills and specializations! The enjoyable, unique illustrations are by Alicia of Art by AmW. She is not just an illustrator, she is an Artist! To see more of her artistic creations, visit her website at www.artbyamw.com. Remember to follow me on social media and visit my website to stay up-to-date with "Biblical ABC Learning" and more! You can also visit www.authordandiilion.wordpress.com to stay up-to-date with Biblical ABC Learning and more!